This is an old old song, based apparently on Mary Queen of Scots, or Bloody Mary (in the picture above, she has the carving knife). I recorded a sweeter version – no carving knife. In the photo to the right you can see the farmer’s wife and her knife. 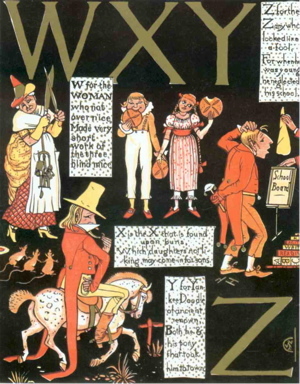 It’s from a book called The Absurd ABC by Walter Crane. The book is in the public domain in the USA. I got it from Project Gutenberg which has lots of copyright free materials. With this song, either create a gap-fill, or do a dictation. Play the song several times asking students to write down all the words. Then do a recycle version. See below. Here is another version of “Three Blind Mice”. It’s fairly advanced, so give students some pre-listening help. Your students may make and sing their own songs too: “Three Wise Squid”, or “I Want Food”, or “Ten School Books”, or “Jean Claude Van Damme.” Use the karaoke version (no singing) below.